 Vagnsset med 6 tankvagnar tpy Zs "VTG Hamburg"
Vagnsset med 6 tankvagnar tpy Zs "VTG Hamburg"
By buying this product you can collect up to 4030 bonuspoints. Vagnsset med 6 tankvagnar tpy Zs 'VTG Hamburg', totallängd över buffertar 60 cm, epok VI. 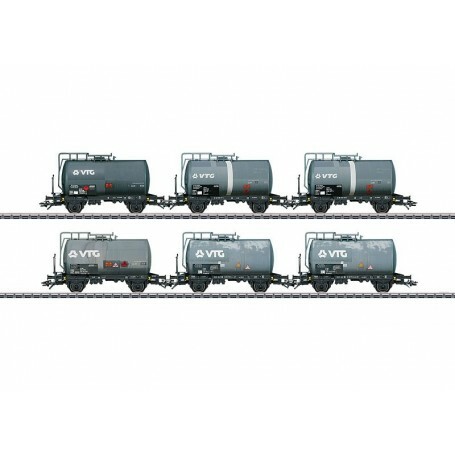 Prototype: 6 different type Zs 2-axle tank cars. Privately owned cars painted and lettered for the firm VTG, Inc., Hamburg, registered in Germany. Brakeman's platforms and end ladders included on the cars. Model: The cars have separately applied brakeman's platforms and end ladders catwalks. All of the cars have a representation of repaired areas. All of the cars have different car numbers and are individually packaged and marked. There is also a master package. Length over the buffers 10 cm / 3-15/16'. DC wheel set E700270.